On the night of April 25 Ukraine ceased electricity supply for the so-called “LPR”. The issue had been discussed for a long time, but implemented only recently. The reason for the disconnection was a UAH 5 billion (€170 million) debt. Will “DPR” and the grey zone face the same fate? Has Ukraine created all necessary conditions to supply energy to the controlled territories that earlier received it from the so-called “republics” for technical reasons? UCMC publishes the material from articles of Radio Svoboda and “Donbas.Realiyi”. “Grey” blackout. How much and who will people in occupied Luhansk region pay for electricity? Cut off electricity – this is a price of low tariffs for “LPR” residents. The reason was a five billion debt. Although people paid, it was unclear whom the money went to. However, it did not lead to the “end” of light in Luhansk. Why has Ukraine turned off power supply for the occupied Luhansk just now? Luhansk region receives electricity from a small front-line town of Shchastia. The local thermal power plant used coal supplied across the front line prior to the trade blockade providing electricity to both controlled and uncontrolled areas. By the morning of April 25, the energy reappeared. But where from? According to the “Minister of emergency situations” of “LPR” Sergei Ivanushkin, it took several hours to reconnect. It turned out that during the war “LPR” had built a new power line from Russia. To be more precise, it finished building the existing power lines. Everything they needed was prepared much earlier. This branch never stopped working, but the supply was weaker. 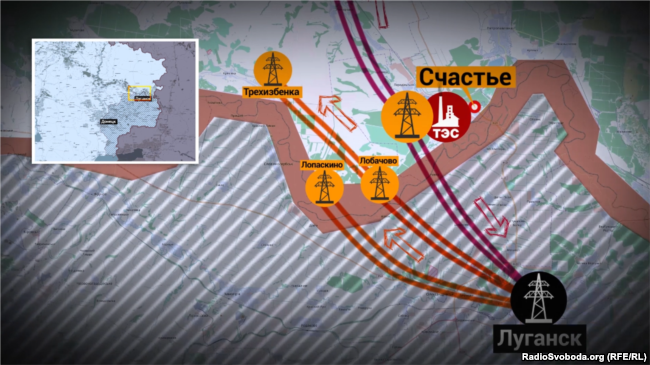 According to Vladislav Deinego, “LPR” representative at the talks in Minsk, now they use the distribution schemes that were used in 2014, when the supply of electricity “from Ukraine” was impossible due to some damage in distribution networks. Who paid for the electricity consumed by “LPR”? Ukraine duly supplied electricity to the occupied territories, but did not receive any money for it. Over the last six months not a single kopiyka was received. So, who paid for the “feast”? Director of the Institute of Energy Research Oleksandr Kharchenko believes that this debt will fall on the Ukrainian taxpayers. Despite the debt, people of Luhansk had been paying for the light all that time. Only the money went to the accounts of a new “enterprise” created by militants. They collected money from people in uncontrolled areas, but it did not reach the provider. Despite this, the government did not authorize the network operator – the company “Luhansk Energy Association” – to turn off electricity. 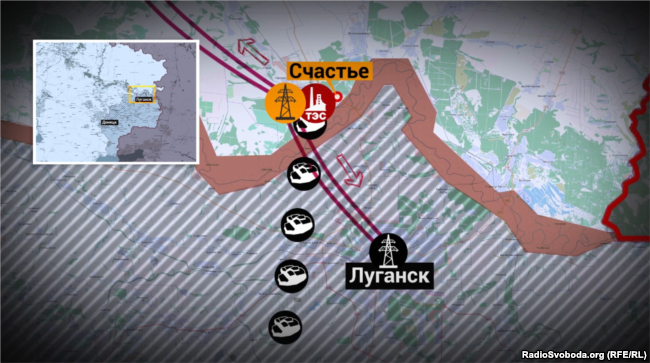 An interesting nuance: it is reconnection of the uncontrolled Luhansk region on which depends whether the power will be supplied to the other side of the contact line or not. Power from TPP in Shchastia is partly supplied to the occupied towns and villages and then is reversed to six non-occupied villages: Triokhizbenka, Kriakovka, Lobacheve, Lopaskyne and Orikhovo-Donetske. These villages received electricity from the occupied territory due to the interchange power flows. Then the electricity was cut off. Power cut in Triokhizbenka lasted few hours. 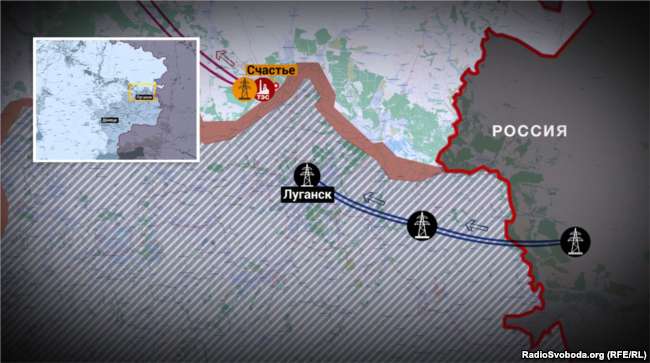 At night, Ukrainian energy workers reconnected Triokhizbenka and surrounding villages to the Ukrainian line. It was a matter of a few hours. “Lobacheve and Lopaskyne even did not notice how they were reconnected. The hardest thing was to connect to the line from Tryohizbenka to Orikhovo-Donetske,” noted Vitalii Velikonda, head of Triokhizbenka military and civil administration. How much will people in occupied Luhansk region pay for electricity? Will people pay for Russian electricity? If they will, how much then? The occupation authorities took 70 kopeks to 1 rouble 20 kopeks for Ukrainian electricity. The rate in Russia comprises 3 to 5 roubles. Now residents of the uncontrolled territory will receive such bills unless the Kremlin just supplies power to them as a gift. “Apparently, the Russians will either pretend these electricity volumes are circuit losses or will not ask about money, because as soon as they enter financial relationships, immediately the question of sanctions against companies that supply electricity to them will be raised,” notes Oleksandr Kharchenko. Today, when militants get free energy from Russia, nothing prevents them from collecting money for it from local residents and spending it. In fact, the Kremlin has long been preparing for the blackout. They delivered generators to the uncontrolled territory and finished constructing the network. 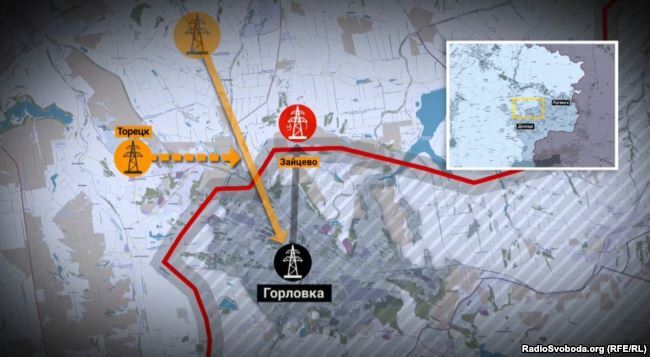 According to experts, this is not a large-scale construction of the new transmission line from Russia. It takes only a week and consists of a few transformers. Will electricity be turned off for the so-called “DPR”? There’s no danger of blackout for “DPR”. It appears that they pay for electricity, and do not consume much. Besides, some Ukrainian towns and villages still depend on the reverse supply from “DPR”. Eleven months without electricity and water: this is the reality of residents of “gray zone” – settlements located on the front line between the two sides of the conflict. These villages are exposed to sniper fire. Bakhmut residents receive water only on Tuesdays, but otherwise live a normal life. There are both electric poles and wires to restore power supply. In June, nearby Zhovanka, Bakhmutka and Pisky will mark the first anniversary of life without electricity. More than a thousand people live there. Local residents are happy that at least there is water to extinguish fires from attacks in their houses. It is difficult to restore power in these towns. First it is supplied from Ukraine to uncontrolled Horlivka, and then is to return to the “grey zone.” But the lines were broken, and militants do not allow the Ukrainian side to repair them. In autumn, the authorities decided to extend the line from Toretsk. It was extended only to Mayorsk, because the Ukrainian bureaucracy obstructed the electrification process. Local people are wondering why electricity, water and gas are supplied to militants-controlled Horlivka.